Are you struggling to get customers? Let’s start with a FREE website audit and find out what’s wrong with your website. Enter your website below to get the report. Want To Grow Your Business with Search Traffic? We are a web design and marketing agency specialized in Search Engine Optimization aka SEO. 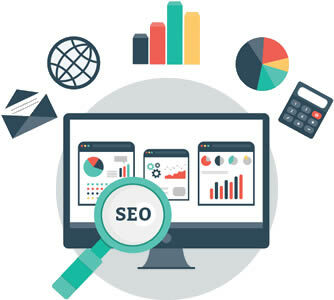 We will help you audit your website SEO, find any problems with it, create the best strategy, and a great looking website that will rank at the top of Google. Bad Google Ads Campaigns can cost you a lot of money. That’s why you need a team that knows what is doing. We setup campaigns the right way, so you can make more money from your marketing efforts. We can help you find out what issues your website has, and give you a report and a plan of action. Where you should put your efforts and invest your money and time. From finding the best keywords to content production and link building, we help you manage the whole process with our Search Engine Optimization service. Most web design companies focus on the looks and neglect the rest. We build websites thinking about your brand, marketing, SEO and sales; websites that do not only look good, but transmit your brand, can help you rank on Google, get more traffic and customers. What are your current challenges? How can we can help you? Design a plan of action that fits your goals. Start working and getting your the results you want. My team has been working with Ricardo for several years now and considers him to be a an essential part of our team too. He developed our website and never hesitates to make any requested adjustments. He is creative, proactive, offers unique solutions, and always on top of the cutting edge trends and technology. This is key for us. Additionally, as a business owner this give me piece of mind! I strongly recommend his services. Ricardo Nuñez and Lusosystems are the best. I recommend them for your Internet Marketing. His creativity and knowledge speak for themselves and I cannot recommend his services and professionalism highly enough. Lusosystems has been wonderful to work with. Their internet marketing and SEO expertise and behind the scenes follow up work has been instrumental in maximizing the potential of our business. Their efforts in not only delivering us an awesome service but continuing to support us. We established our website presence in Jan 2011 within 6 months, Lusosystems was able to put us on the first page of Google for most of the local targeted markets and services we desired. We found their knowledge for local, targeted, niche marketing on the internet to be invaluable. Whether you are a construction company or a health service provider, our goal is to help you grow your revenue and be part of your success. Our goal is to help you increase your revenue! Let your website make you more money - by improving your website and using our internet marketing services to drive more traffic to your website and converting that traffic into leads and customers. We solve your search marketing problems! Let us help you and get your website in the right shape to make you more money. By generating a continuous flow of leads using our SEO services, web design and Google Ads management service we can help you get there! Learn How To Get More Traffic! Receive our weekly newsletter with FREE tips on how to grow your website's traffic.